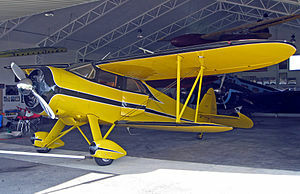 The Waco E series is a small family of American-built cabin biplanes built between 1939 and 1942. The E series was the final development of the prewar Waco line of biplane designs. A full four-seater, it had the best performance of any of the Wacos. First flown in 1939, it had a much slimmer and more streamlined fuselage than earlier Waco C and S models and heavily staggered unequal-span parallel-chord wings with rounded tips. Wings were plywood-skinned, and also had wire cross-bracing between the wings in place of the solid struts used on previous models. Engines varied in power from 285 to 450 hp (213 to 336 kW), giving the E series a high cruising speed for the period of up to 195 mph (314 km/h). Production ceased in 1942. The E series was sold to wealthier private pilot owners who required the comfort of a fully enclosed cabin and a high cruising speed, combined with a longer range. Because of the type's good performance, 16 examples were impressed by the United States Army Air Force during World War II for communications work as the C-72. Several examples were civilianised after the end of the war and five E series aircraft remained airworthy in 2001.